Many People get tattooed and bitterly regret the decision later on. What seemed like a good idea at the time can cause major problems in later life. For some people, having a tattoo can mean psychological distress. For others it can mean difficulty in getting a job. What ever the reason, help is at hand. Until recently, all other methods of tattoo removal involved major scarring. Fortunately, modern laser technology means that having an unwanted tattoo removed is now usually a simple process that is available to everyone. 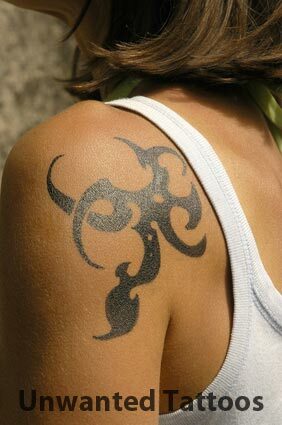 • Why is a tattoo so difficult to remove? A tattoo results when the skin is punctured and pigment is inserted into the lower layer of skin. The body’s own immune system reacts to this ‘injury’ but is unable to cast out the larger particles of pigment. • How do the lasers work? Tattoo ink particles are too large for the body’s immune system to remove naturally. By firing a beam of light through the skin in extremely short pulses the light is absorbed by the tattoo ink creating a reaction, which breaks it down into very small particles. The body’s immune system then gradually removes the pigment. • How many treatments are required to remove a tattoo? The number of treatments required will depend on the body’s immune system and how effective it is. As a guide, most Indian ink amateur tattoos require 3 to 5 treatment sessions at monthly intervals. Most coloured professional tattoos usually require 8 to 12 treatment sessions at monthly intervals. • Do all tattoos respond to treatment? Yes in the majority of cases, although it is impossible to give an absolute guarantee as some pigments can resist treatment. No one laser can remove all types of tattoo ink, so this is why for optimal results 3 different lasers (Q-Switched Ruby, Q-Switched ND YAG and Q-Switched KTP) are used. • How long does it take and does it hurt? A typical treatment session can last between 5 minutes to 1 hour, depending on the size of the tattoo. The treatment stings and may cause some minor discomfort which will start to subside when the session is over. This is tolerated well by most patients, but a local anaesthetic cream and /or skin cooling can be provided to minimise discomfort. • Are there any after-effects following treatment? Redness and swelling may occur, which settles within a few days. Some patients may blister. This is quite normal and does not indicate potential scarring. No specific treatment is required and it will usually clear within a few days. A dry dressing may be applied to avoid contact with clothes, etc. When bathing or showering, the area should be patted dry and not rubbed. If blistering occurs, prolonged immersion in water, e.g. swimming, should be avoided. Between treatment sessions the treated area should be protected from strong sunlight or sun beds with sun block (SPF 30). • Does the laser treatment scar? Lasers used to remove tattoos are Q-switched, which means the lasers deliver high power in a very short pulse (25 billionths of a second!). There is normally no lasting damage to the skin. Very occasionally, mild changes in skin texture may occur. The vast majority of people are delighted with the results. Although scarring is a possibility, the chances of this occurring are very low. • Will the skin be normal when treatment is finished? During treatment with Ruby and KTP lasers, it is quite normal for the tattooed area to become paler and any freckles may disappear. This is because the lasers are also effective at removing natural skin pigment (depigmentation). Once all the treatments have been completed, the pigment should slowly return. This may take anything from 6 months to several years. Darker skinned patients are generally limited to treatment with the NdYAG laser as the risk of pigment change is less. A tattooed area which is particularly hairy should be shaved prior to treatment. The hair should grow back normally but in some cases may be slower than expected. • Is Laser treatment safe? Yes. There is no evidence whatsoever to suggest that the treatment can lead to skin disorders or an increased risk of cancer. Furthermore, every precaution has been taken to ensure the safety of the patient. Having met all the necessary conditions, each Laser Clinic should be registered with the Care Quality Commission. The lasers are also subject to annual checks by the Regional Radiation Physics & Protection Service.